Dean Lohse of Jacksonville, Florida, is a recent graduate from Warren Barker's Fundamentals of Boatbuilding class at the WoodenBoat school. 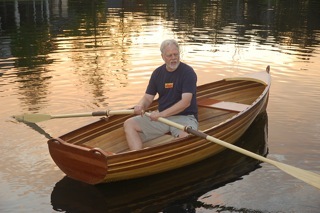 He put much of that newfound knowledge to use in the construction of this Lawton Tender, that he built from a kit created by Newfound Woodworks of Bristol, New Hampshire. Dean is grateful for the help he received from his young friend and neophyte to boats, Brennan McDonagh. The boat is cedar strip covered with epoxy and fiberglass. 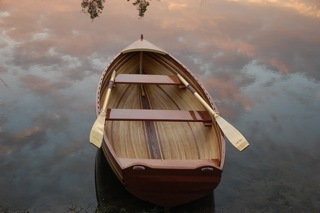 The stem is ash while the seats and transom are cedar. The pair spent five months on the construction. 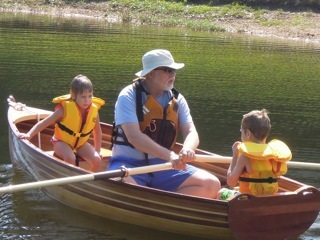 Dean plans to row the boat with his grandchildren on the St. John's River and other inland waterways of northeast Florida. Plans and kits are available at www.newfound.com/index.htm.